We didn't need Hollywood to tell us that Allah Rakkha Rahman (or A R Rahman, as we know him) is a genius. But the Oscar is definitely welcome, and Rahman deserves it all the way. He's the first Indian music director to have taken the path less trodden and composing with a fresh, imaginative mind. I first encountered Rahman when I heard Dil Se... and I recall that the haunting music really grabbed me and made me reconsider Bollywood music...which I wasn't a fan of at that time. Then on, this shy, but consistent music maestro has delivered hits like Taal, Fiza, Zubeidaa (another beautiful album), Yuva, Swades, Jodhaa Akbar, Ghajini and now Delhi-6. 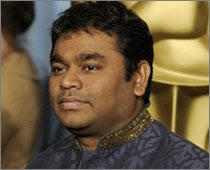 Slumdog Millionaire is not Rahman's first tryst with the West as he has worked with Andrew Lloyd Webber on the Broadway musical, Bombay Dreams. The greatest quality of Rahman is that he completely blends his music with the stroyline and character of the film. Take his latest, Delhi-6 example. He's done this album so well, you would think its a Delhi native and not a man hailing from Tamil Nadu who's created it. As for Slumdog Millionaire, it's certainly not his best work, but far superior than the film music Bollywood and even Hollywood normally churns out. So much music in so little time. I think the man sleeps, eats and drinks music. True - the Delhi 6 song "Yeh Delhi hai mere yaar" is so haunting. Congratulations to Rahman. well rightly said we did not need hollywood to tell about this musical genious..
when i heard him first time in his first movie 'Roza', i got it that this composer has definitely something which i still cannot heard from any other composer and musician, he is such a creative and fastidious composer.. It is so difficult to tell which was his finest composition so far i just love all of his songs' to name a few 'O palanharay' from lagaan such a inspiring music. and another 'haji ali' a sufi compostion from the movie 'fiza' the list is endless.. Even after dozen of awards in his name he is still thrive and hunger for a unique musical creativity in his every new compositon as he is done in his very first movie.. He is indeed a genius, and we all knew that, Oscar or not. Oscar no doubt is a dream come true for everyone in film industry...and yeah its only a icing on the cake for rahman...I'm happy that i've had opportunities to listen to many of his master works in tamil..
and hey FUI rahman is the first indian to win two oscars not the first one to win a oscar...it was Bhanu Athaiya in 1982 for the movie gandhi...and another sweetener, the first one happened to be a female artiste..